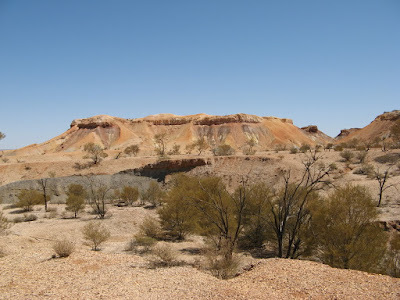 The Old Andado Track is an interesting and alternative route from Alice Springs to Oodnadatta through the fringes of the Simpson Desert. 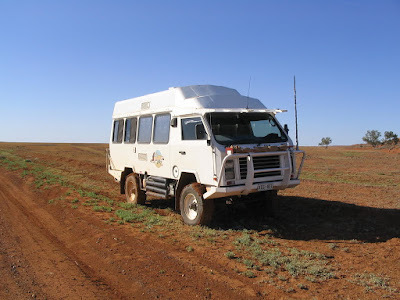 It then joins the Oodnadatta Track which leads on to the Flinders Ranges and Adelaide. The red desert scenery is stunning and there are plenty of things to do and see along the way. The section of the track from Alice Springs south to Oodnadatta is a lonely 4wd track in reasonable condition and in the dry it could be done in a sturdy 2wd vehicle. Note however that only a small amount of rain can turn the track into sticky quagmire and we got stuck overnight after only a brief thunderstorm. The track takes in the Santa Teresa Mission, Old Andado Station, the Mac Clark Acacia Peuce Conservation Reserve, Mount Dare Station and Dalhousie Springs before heading down the Oodnadatta track to Maree and Port Augusta. 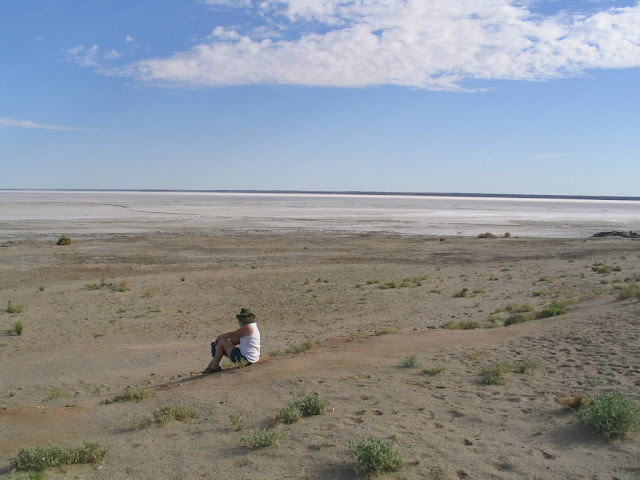 Interesting side trips can also be made to the Painted Desert west of Oodnadatta, Old Peake Telegraph Station, and Halligan Bay on Lake Eyre. 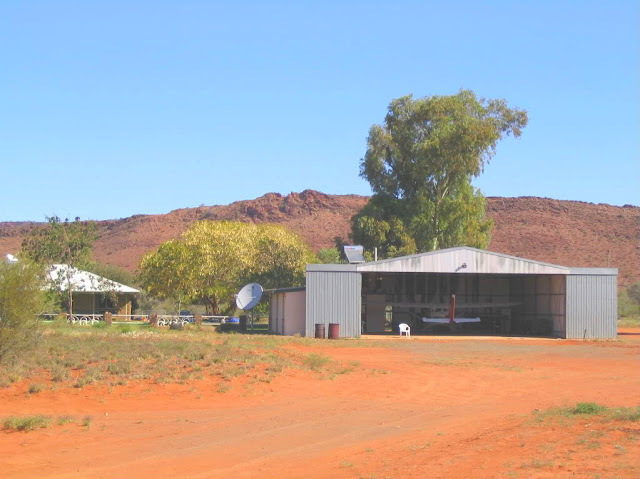 Santa Theresa is an Aboriginal community and Catholic Mission about 85 km south east of Alice Springs. There are some grand looking buildings there but a permit is needed to enter. 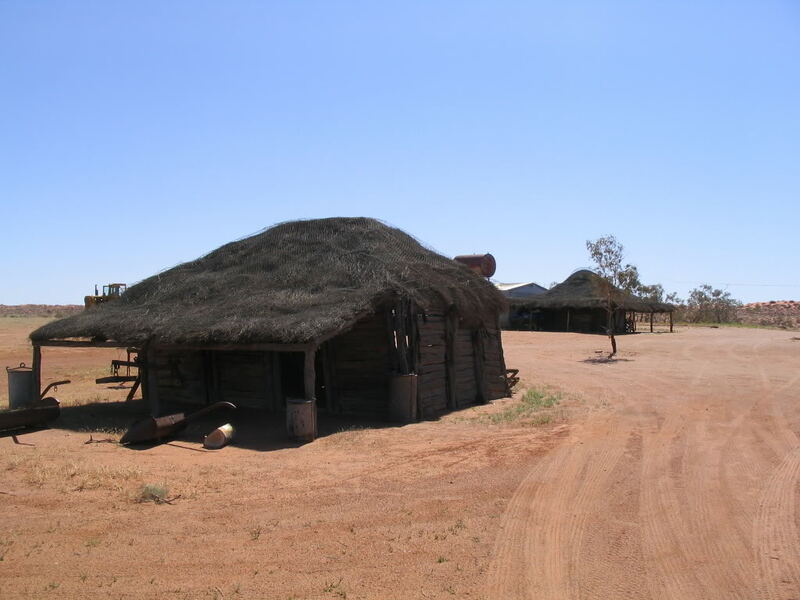 A descriptive document on the community can be found here and you can now take a tour from Alice Springs and meet the local inhabitants. See The Inside Trip site here. 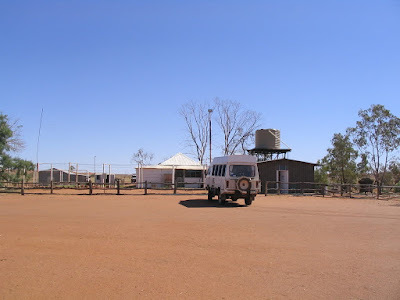 The remoteness of the area can be judged from the garage near the Allambi homestead. 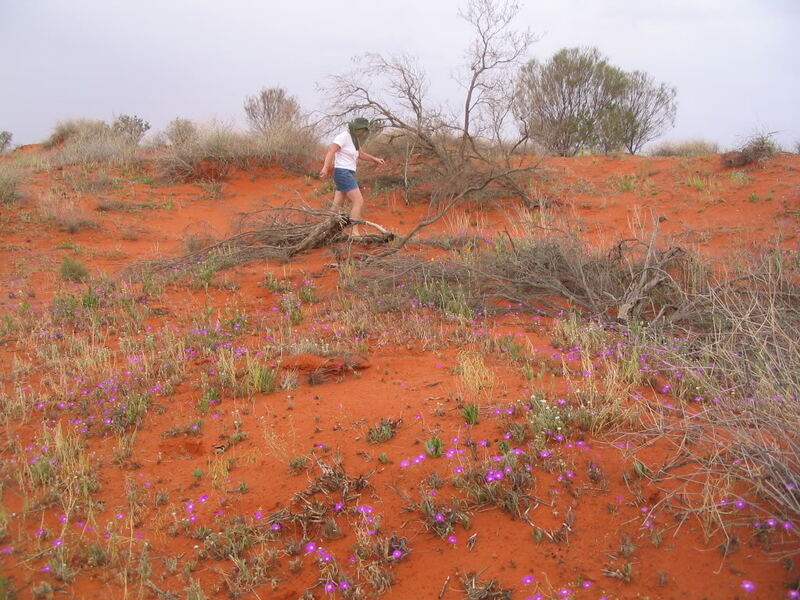 From Allambi Station, the track runs straight south east for about 80 km between deep red sand dunes, many of which are covered in wild flowers. This is a small reserve at the end of the sand dunes, about 8 km off the track, and is well worth a visit. 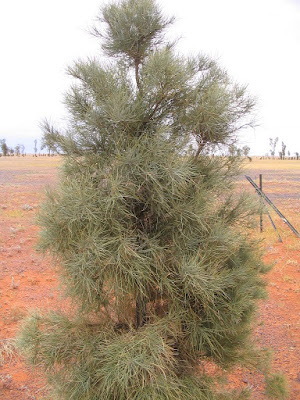 The Acacia Peuce (which is Latin for pine-like) is a very hardy, prickly tree whose timber is tough and rot resistant. It was almost chopped down to extinction for fence posts and fire wood during early settlement. The wood is also known as waddy wood after the wooden implements and weapons made by aborigines from the tree's timber. 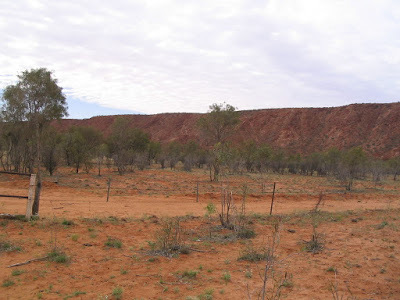 Mac Clark ran Old Andado Station during the 40's to the 70's and started the reserve to protect the few remaining trees. 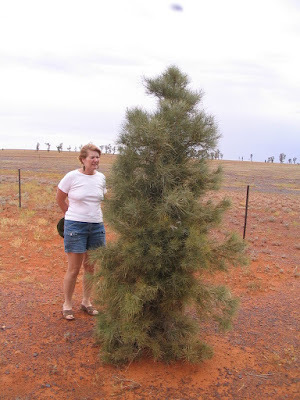 There are over 1000 of these now rare trees in this 3000 hectare reserve, many of them several hundred years old, but they can only be found here and a couple of other places, on the Birdsville Track and near Boulia. 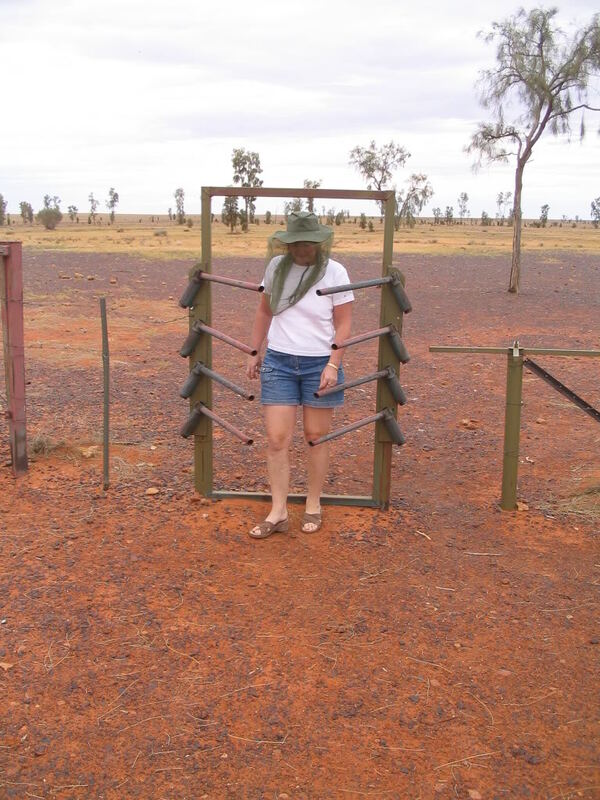 The spring loaded bars on the cattle gate at the entrance to the reserve allow cattle out, but not in. It works for people too. As we left the Mac Clark Reserve we heard the ominous rumblings of thunder and saw a storm approaching directly towards us. Our preferred option was to try to outrun the storm by turning south at the road junction but it seemed to follow us. 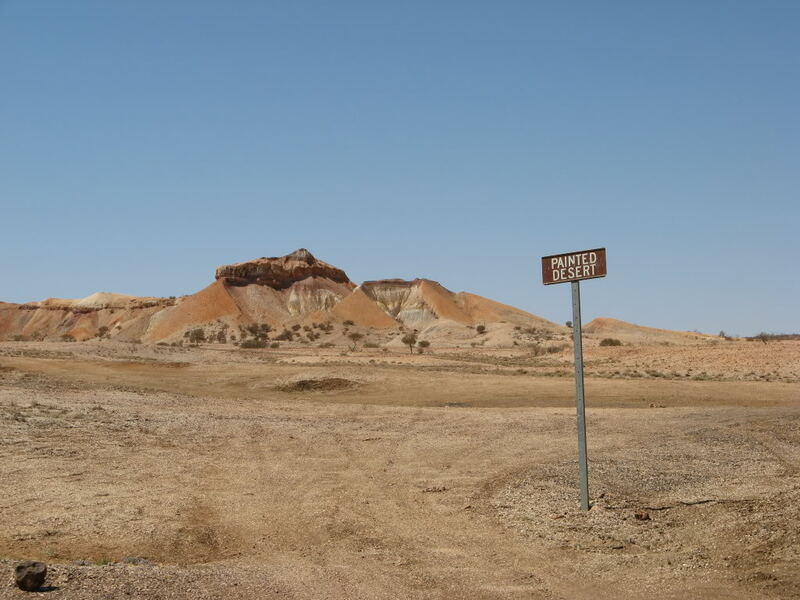 As we raced back towards the junction, we couldn't help recalling the sign we had just seen in the reserve which read: "In a thunderstorm, you don't want to be the tallest thing around". Guess what? 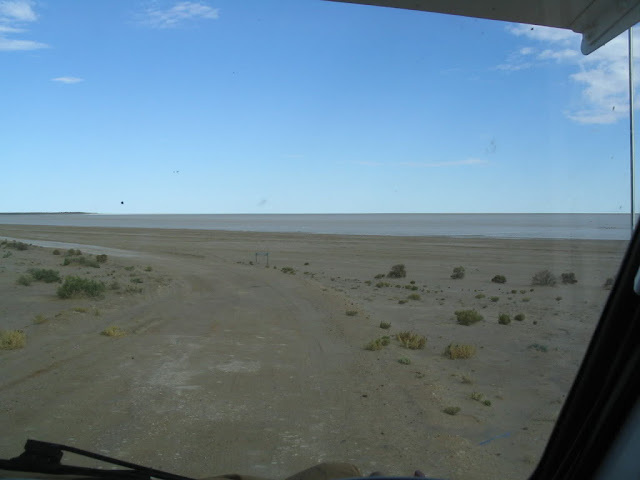 We got to the junction just in time and made for the relative safety of some nearby sand dunes, which were about the same height as the Oka. There we waited like scared mice, as the lightning crackled around us, until the unpredictable storm had moved away. However, while we were fortunate to be safe, the brief storm had turned the surface of the track into a gooey mess. The tyres picked up a 1 cm layer of sticky mud from the top of the track and bound it around the tyres turning them into slippery doughnuts. No amount of 4WD torque or skillful driving could prevent the Oka from sliding all over the track so, as it was mid afternoon anyway, we stopped for the night to allow the track to dry out. 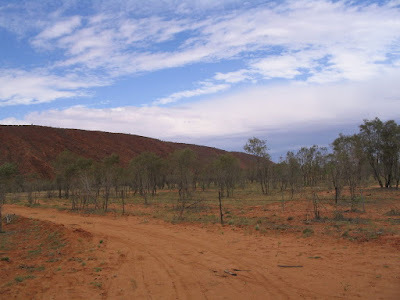 By next morning the track was dry again and it was safe to proceed. 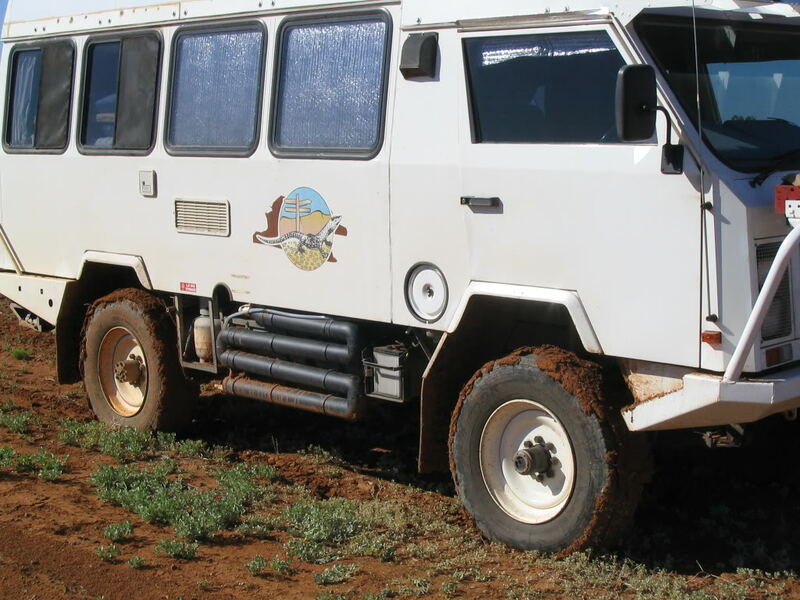 It doesn't look much, but the tyres are covered by slippery doughnuts of mud. We stopped to let them dry out before it got too thick. Andado Station was a 11,000 sq km cattle station which covered a large area of beautiful red sand dune country. In 1987 Molly Clark, the wife of the owner who had tragically died in a light aircraft crash, re-negotiated a lease of 45 sq km around the homestead and renamed the area Old Andado. At the centre of the station is the Old Andado Homestead, 35 km south of the Mac Clark Reserve which Molly set up as a authentic pioneer museum and tourist location. See here for a fact sheet. 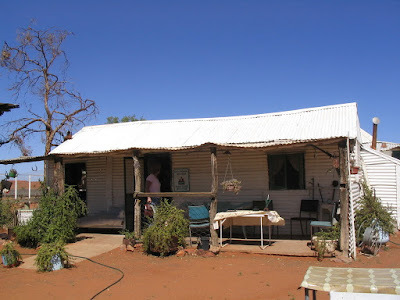 Although the homestead is no longer the nerve centre of the station, it is quite often occupied by caretakers, which makes it an excellent stopover for passing travellers. 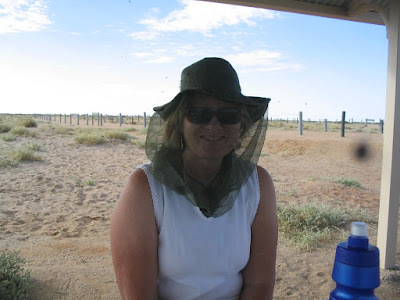 It was a delight to meet them, have a look around the facilities and enjoy a cup of tea on the verandah, even if we did have to strain the flies out of the milk. Old Andado Station has a web site here which is well worth a visit. It provides some interesting background on life on the station and how the property is being maintained. 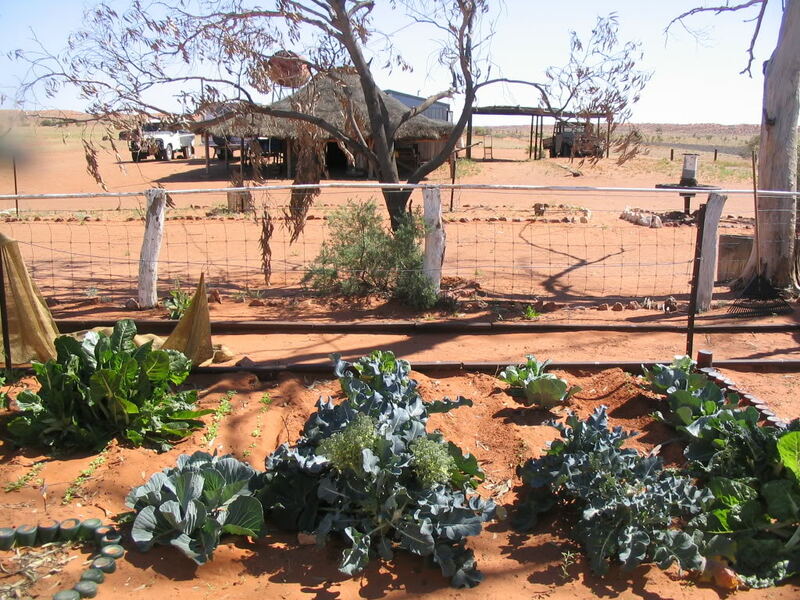 Molly Clark, the current owner of Old Andado Station, was caretaker there for many years until she had to move out in 2006 due to ill health. Now working bees have been started to give volunteers the oportunity to help maintain this wonderful outback property. See the Old Andado website for details. The next "Molly's Bash" is in May 2010. Dalhousie Springs near Mount Dare are one of many artesian springs in central Australia. 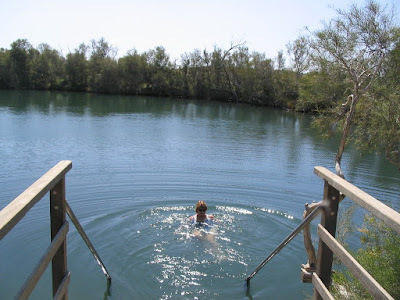 What makes Dalhousie special is that the water emerges at 38-40ºC all year round and a swim in the large lake formed by the springs provides a welcome relief to the dry desert conditions surrounding them. Be warned however, that swimming in water at this temperature can be very tiring, so make use of the rubber tubes supplied and don't swim far from the steps. Surprisingly several species of fish thrive in the lake, obviously well adapted to living in hot water. About 85 km south-west from Oodnadatta (not the Oodnadatta Track west to Marla) is a track which leads across the Painted Desert on Arckaringa Station. 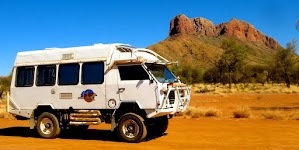 There are various walks and look out points in an area of outstanding beauty, plus a good camping area near Arckaringa homestead. 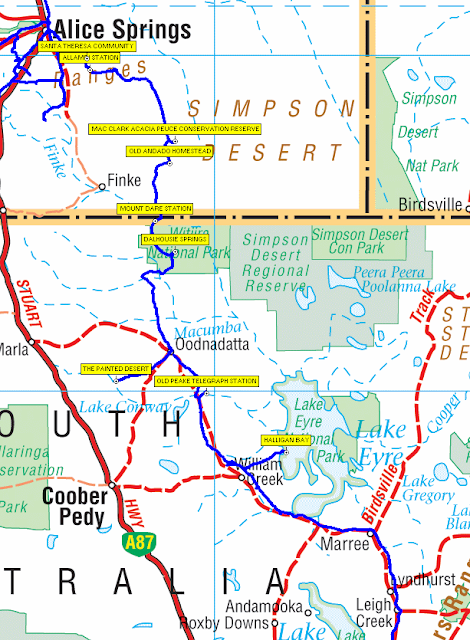 Continuing west on the track would lead to the Stuart Highway at Cadney Park but we retuned to Oodnadatta and turned south down the Oodnadatta Track. On the return leg, a lot of shining mica deposits can be seen on the hillsides, glistening in the afternoon sun. 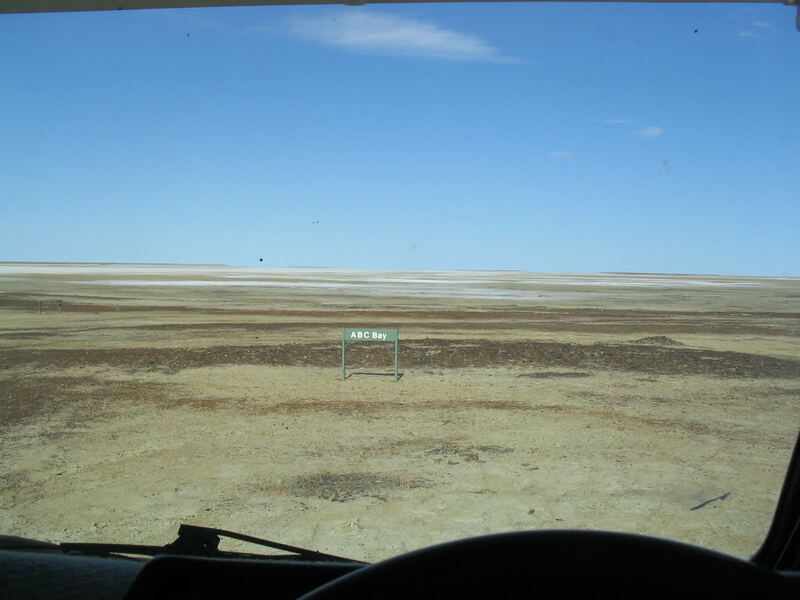 Hookey Waterhole near Oodnadatta makes a good lunch or camp site. 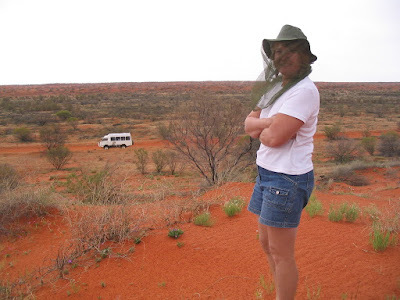 And on the subject of Oodnadatta, have a giggle at the Oodna-bloody-datta poem here and then look at the rest of the interesting stuff on the Pink Roadhouse website. 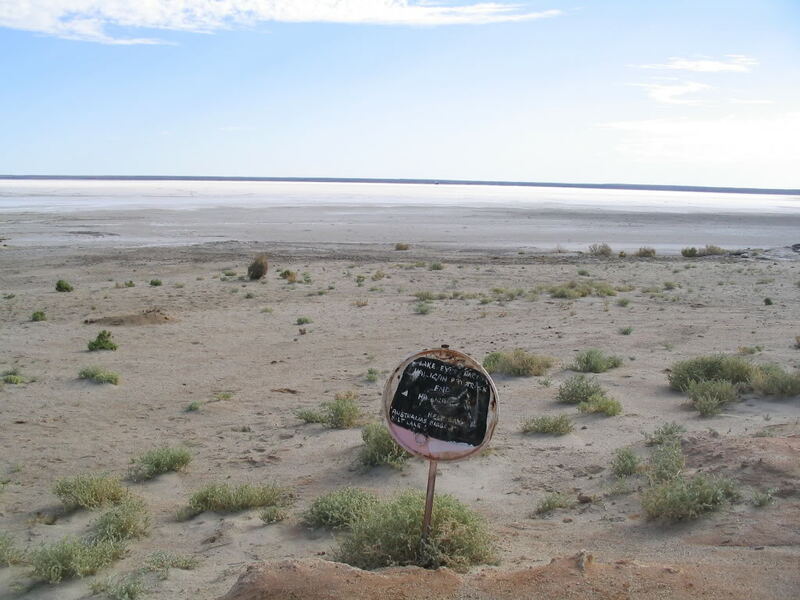 One of the few places to access Lake Eyre is the Public Access Track about 6 km south of William Creek which leads out 60 km to Halligan Bay on Lake Eyre, and a more desolate spot it's hard to imagine. "With bitter feelings of disappointment I turned from the dreary and cheerless scene around me" wrote Edward John Eyre in 1840. Not much has changed in 170 years, except we don't have to walk to the dreary and cheerless scene anymore. Actually the drive is quite interesting in an outbacky sort of way and ends up on the "shore" of the lake where there are plenty of beach front properties to choose from. Also check your altitude on your GPS. 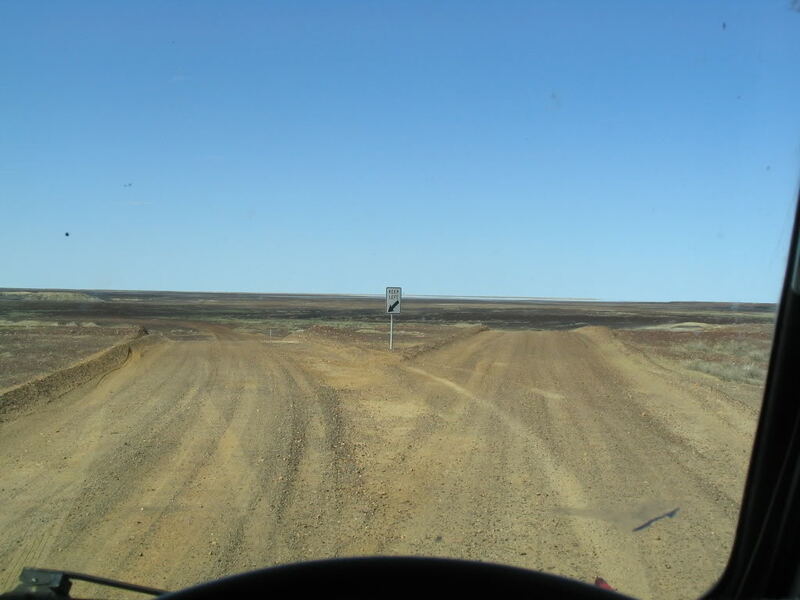 It should read about -15 m.
The track has road signs? There is a car park and camping area at the end of the track and a small emergency water tank but please don't use it unless desperate, it is there for emergencies only. 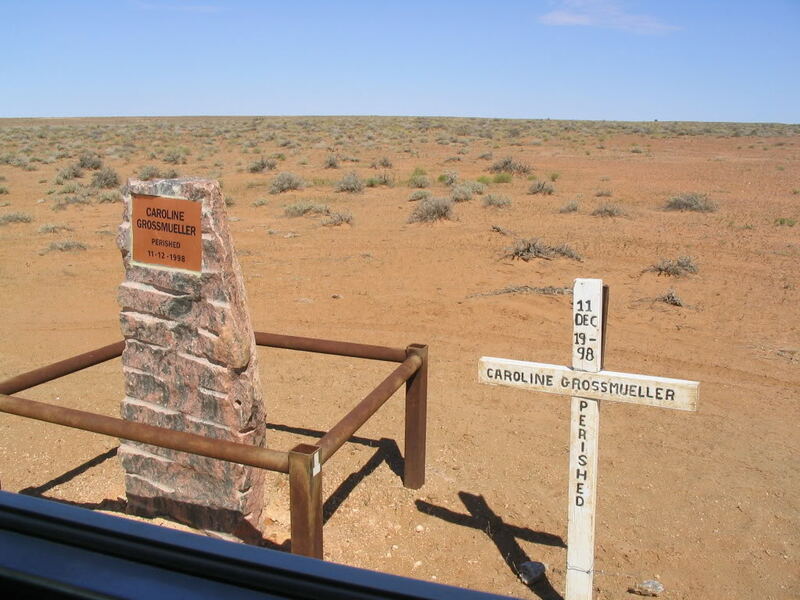 And this is why: on the way to and from the lake you will pass the memorial to Caroline Grossmueller who died of thirst on this track in December 1998 when her vehicle became bogged and she tried to walk for help. She got 30 km before succumbing to the heat. 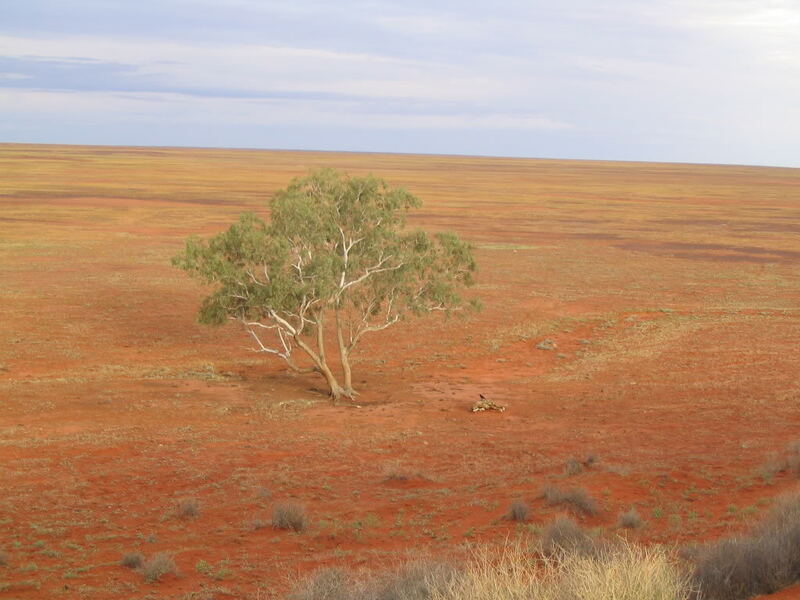 Take heed of the environment, not just here but in all remote locations, and carry an EPIRB or other reliable means of long distance communication. According to the Pink Roadhouse (see here), her death has led to most rental 4wds now being fitted with EPIRBs, which is a good thing. 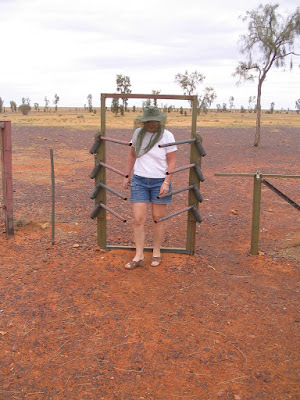 Hopefully, overseas tourists renting 4wds are also being given some rudimentary training on how to survive in the outback. It can be a very harsh place. 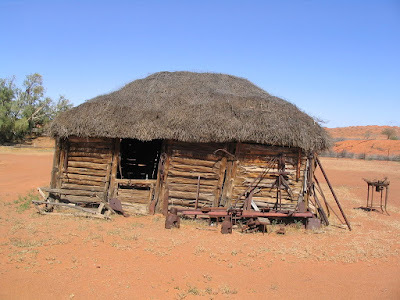 Because it's out of sight about 15 km off the track, and hidden behind a range of hills (the Denison Range), the Old Peake Telegraph Station is seldom visited, which is a shame because it's one of the most interesting side trips along the Oodnadatta track. The track to Old Peake starts about 80 km south of Oodnadatta and about 30 km south of the Algebuckina Bridge. 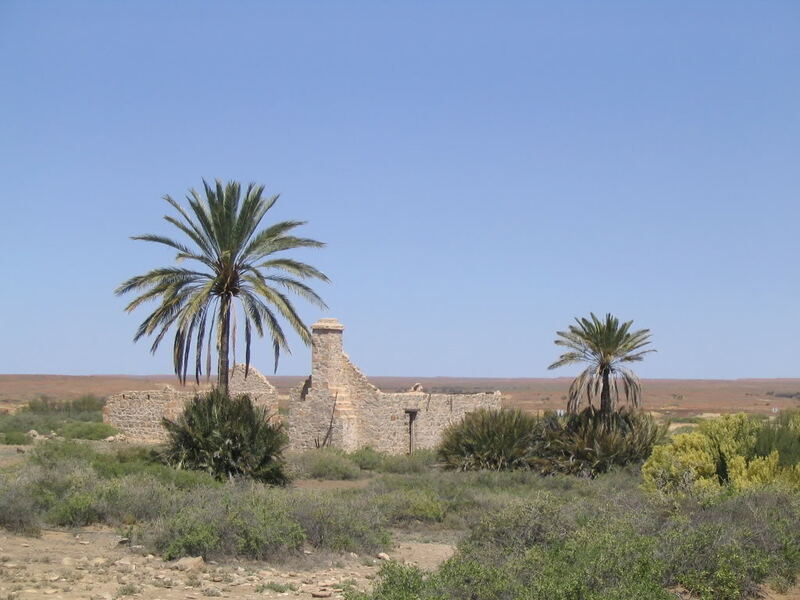 It leads 15 km east, around the back of the hills to the ruins of the telegraph station. These are laid out on a hillside overlooking a very pleasant green valley, with a creek flowing at the bottom. 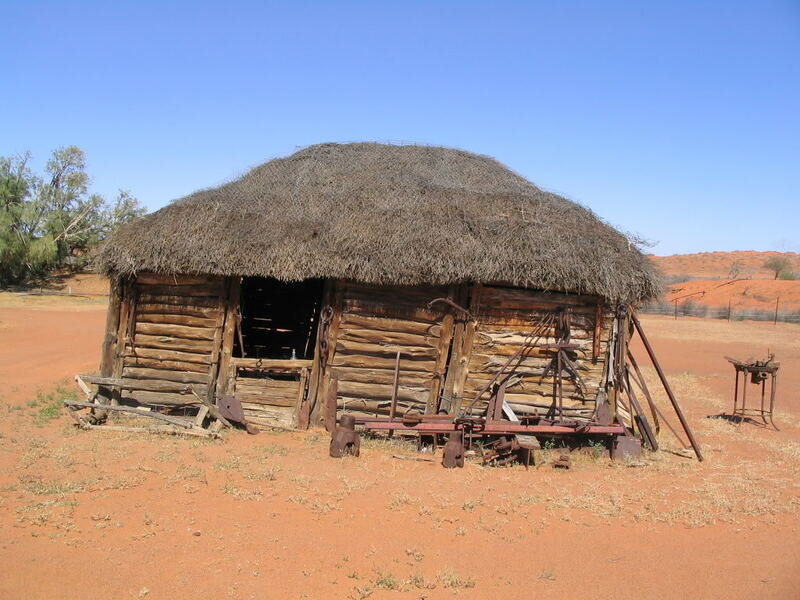 The Old Peake Telegraph Station was built in 1870-71 as part of the overland telegraph from Adelaide to Darwin. It commenced operations in 1872 and was closed in 1891 when the facilities were relocated to Oodnadatta. 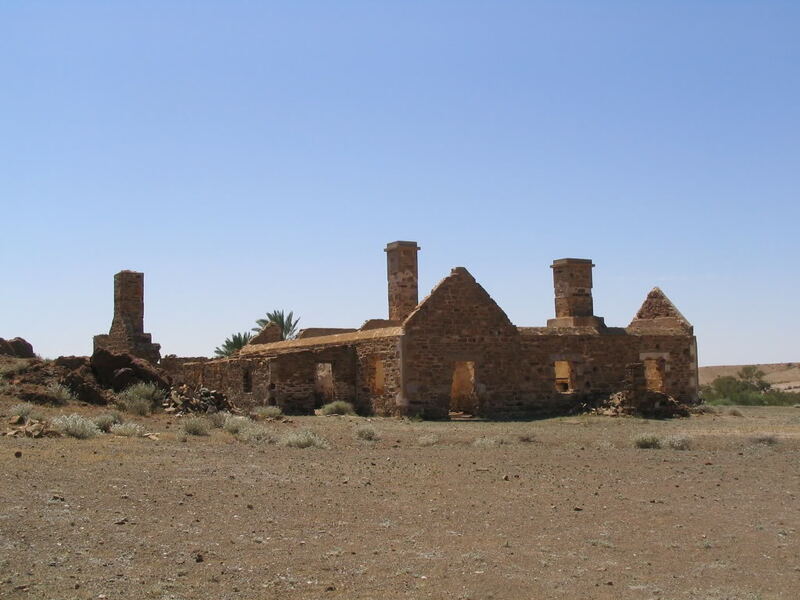 There was also a copper mine attached to the site, the ruins of which are still visible. The technology was progressively improved with voice communications introduced between 1925 and 1942, then the wires were replaced by radio links in the 1970's, but surprisingly, the last elements of the original Overland Telegraph were not finally replaced until 1981, more than a century after it began operations. I'd like to see the 3G network last half that long. The Old Peake Telegraph Station is well worth a day's deviation off the Oodnadatta track and there are plenty of bush camping sites around the creek. To be completed... one day.